Israel PM Netanyahu's India visit postponed? Has Israeli Prime minister Benjamin Netanyahu's India visit got postponed? It appears so. The buzz was that he would be visiting India for a few hours on February 11, before heading to Warsaw. Now, it appears this may not be so. Officials, however, said that a visit which was not confirmed cannot get cancelled. A spokesperson from the Israel Embassy said, "We reiterate what the Indian Ministry of external affairs spokesperson Raveesh Kumar said on January 31. That both offices are working on a short working visit of our prime minister to India. The date and details of the visit are being worked out and will be communicated when finalised." The embassy, however, emphasised that there was a very strong will to make the visit happen. Netanyahu had visited India last January, and Narendra Modi had given him a special treatment, taking him to his sate Gujarat, too. 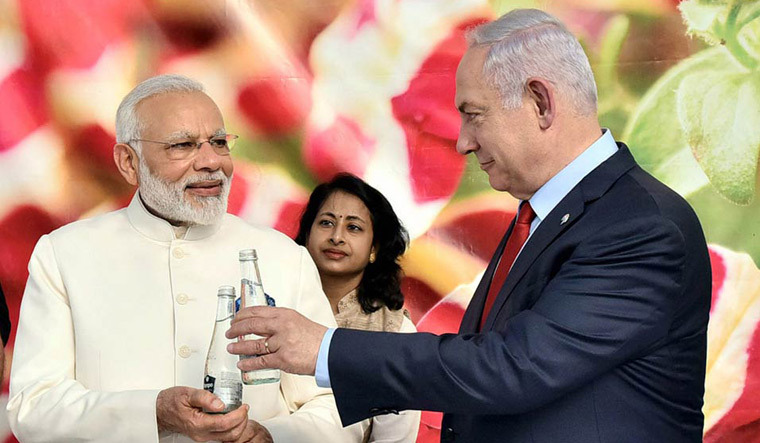 Modi himself had visited Israel in July 2017, becoming the first Indian prime minister to do so. The visit was perceived to be a thumping foreign policy success, with India finally deciding to dehyphenate Israel and Palestine. India has expanded its relations with Israel well beyond the military one. While Israel is a big supplier of defence equipment to India, over the years, the association has expanded to exchanges in science and technology, and more importantly, irrigation and agriculture, with Israel helping India's farming sector in drip irrigation technology and also in horticulture. It is believed that Netanyahu's India visit is with regard to finalising some major deals, mostly military. India's military relationship with Israel remains largely that of a buyer-seller one, though Indian Navy does exercises with its Israeli counterparts whenever its ships are transiting from near Israel. Israel: Netanyahu's poll push set to backfire? The scope of the bilateral is gradually being built up with high-level visits. In January, Israeli National Security Adviser Meir Ben-Shabbat visited New Delhi for talks with his counterpart Ajit Doval. He met Modi, too. With the country clicking into election mode, foreign dignitary visits will soon stop, as will Modi's tours overseas. Modi will be heading to Seoul, however, later this month to receive the Seoul Peace Prize. Israel, too, is scheduled to go for elections in April. The two countries are keen to have Netanhayu's visit, soon, therefore.